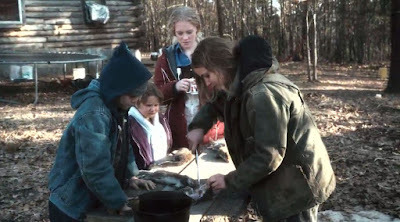 I suppose what I need to say when I say some of the things I'm going to say about the USA in writing about Winter's Bone, is that it doesn't come from any place of imagined superiority. If there's anything we've learned in the last two years it's that the faultlines in British society are fully as deep and ragged as those on the other side of the Atlantic; they're just in different places, and when Liam Fox said the other week that we're the only Western nation who didn't have anything from our last hundred years of history we needed to sweep under the carpet, this was only because we've been so good at having already swept it under the carpet. Britons are profoundly ignorant about their own history. But the faultlines are different. For example. Not long ago I saw a trailer for a movie starring John Travolta as a guy fixing power lines, and it was framed as a Heroic Tale of Everyday Courage in the Face of the Elements, and it seemed so weird, so absurd to me that I was half expecting a Funny or Die stamp on the end of the video, only it was entirely serious, working on the Grid really was something that filmmaker unironically considered worth turning into a film starring John Travolta. And there are a lot of things about the USA that people this side of the Atlantic actually treat with shock, confusion and disbelief, and how much of a mess, how relatively primitive the infrastructure is, that's just one of them. Some examples: bad weather still causes power cuts in New York, blacking out literally a million people at a time; the last one was only a month ago, apparently. To someone who grew up in provincial British towns where the last time candles were kept in the cupboard for anything other than occasional decorative reasons must have been in the 1980s, this seems barely credible. In the US, you get billed for being rescued by an emergency ambulance. You have to pay for a trip to A&E. They charge you. I can't express how horrifying and bizarre this is, that something that is to us one of the basic appurtenances of civilisation should be just lacking. And in the USA, poor people are much, much poorer. I live in the poorest region (currently) in the European Union. I can hop into my car, drive for twenty-five minutes, and be in the middle of the poorest municipality in Europe. 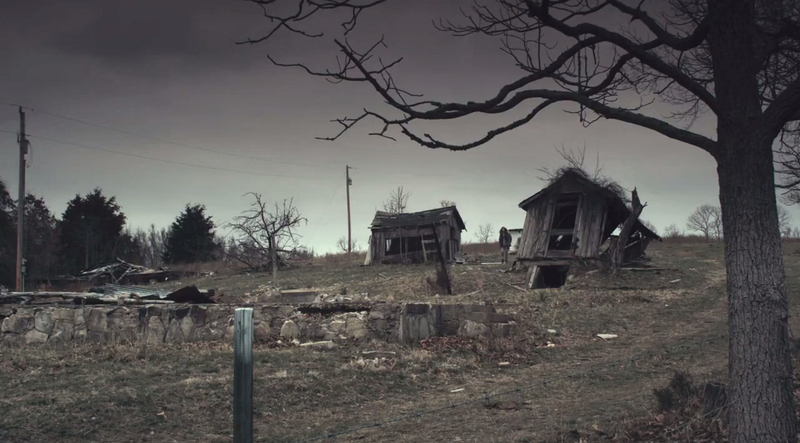 But nowhere in the UK, nine out of ten of the poorest communities in Europe or not, is there anywhere as poor as the region portrayed in Debra Granik's 2010 adaptation of Winter's Bone, one of a series of novels by Daniel Woodrell set in the Ozark Mountains. The only place I've seen poverty like it was on my one trip to India. I remember, after having seen this film the first time, WhatsApping a friend in the US who assured me that yes, it was really like that, that she herself had grown up the mountains, and people really were that poor. Still, the unnamed community where Winter's Bone is set seems like a place of post-apocalyptic science fiction; scattered around the ramshackle houses is the detritus of a more prosperous age. Wrecked boats. Splintered furniture. Old toys. Everything is second-hand, everything is rusted, mouldy. It made me angry, a little, and angrier still on my second, closer watch, that this is real, that people are allowed to live like this in the world's wealthiest country. These aren't the people who voted for Trump; these are part of the majority who saw no point in voting at all. 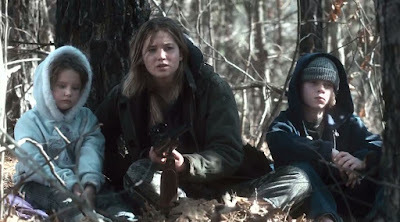 In this setting we are introduced to Ree Dolly (Jennifer Lawrence), who looks after a barely functioning mother and a little brother and sister, and those children are everything to her: when, later in the film, she is helpless and beaten and informed blankly that it's been decided that she's going to die, she pleads for her life, with dignity, on the grounds that her family needs her. When her brother asks her if she's really going to go and join the army, she says she'd be lost without their weight on her back. 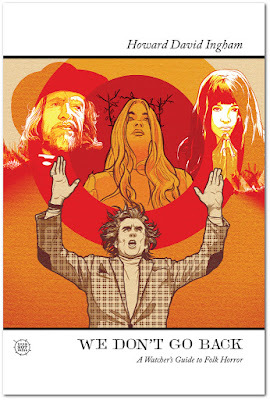 Ree is defined by the bonds of family, and the film concentrates closely on the ties of blood, and when they break. It's a blood tie that drives the plot. At the start of the film, Ree's father Jessup has not been seen for a long time. The nervy, somewhat cowardly Sheriff (Garret Dillahunt, who's your go-to guy if you need someone to play a weasel) informs her that Jessup has skipped bail, he's dude in court on Thursday, and Ree's home and small plot of land, which is literally all they have, was put up as collateral for Jessup's bail. And if either Jessup or the bail doesn't turn up by then, Ree's family, already surviving on the charity of neighbours, will be turfed out into the woods. At the beginning of the film, as her brother stares hungrily at a neighbour's haunch of meat, Ree tells him never to ask for what should be offered. But Ree finds herself doing just that, going from house to house, door to door, asking neighbours and cousins of increasing distance where her father is. And no one is willing to tell her, and the more persistent her asking, the more hostile the response. 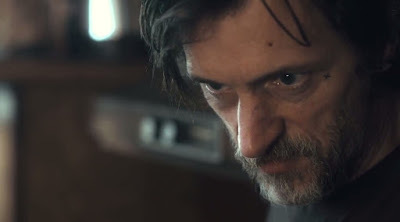 Her uncle Teardrop (John Hawkes) is a walking wound of a man, somehow elongated and worn thin by the drugs that he snorts in front of anyone he speaks to, made of pain and hate. At first Teardrop threatens Ree with violence; but later, he becomes her unlikely protector, only asking her that if she finds out who killed his brother, her father, she must never tell him, because he would have to kill them, and then he himself would likely wind up dead. He represents a world that Ree's father, whose business was cooking meth, was part of, but which Ree is set on never entering except as an interloper; even then, Ree is forced to meet a succession of increasingly terrifying individuals: Little Arthur (Kevin Breznahan), who offers a line of crank and explodes when he is refused; Merab (Dale Dickey), hatchet-faced matriarch whose grudging admiration for Ree's stones never tips over into sympathy; and finally local kingpin Stump Wilson (Ron Hall), a massive man whose only register is emotionless brutality. And while Ree understands that the one rule no one breaks is that you never go to the police, she goes beyond that, because to her, family means something. And only Teardrop responds to the call, without ever once ceasing to be a figure of terror. The only person who supplies Ree with any real compassion or understanding is an army recruitment sergeant, played by Russell Schalk, an actual recruitment sergeant, who is also credited with additional dialogue, which suggests that his part is largely ad-libbed and that his responses are what he'd give to a real person in this situation. Ree would obviously be an excellent soldier, but the man recognises that her greatest challenge is going to lie in bringing up her brother and sister and keeping them on the straight and narrow and tells her this gently and firmly. Ree is in many ways a model parent where her mother is no parent at all. 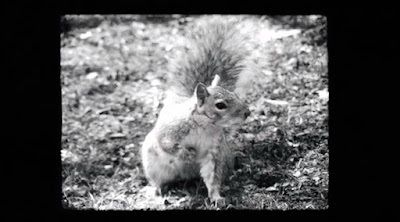 She spends as much time as she can setting up her younger siblings for a hard life, teaching them to survive (and in one scene, even showing her brother how to gut a squirrel). Jennifer Lawrence was almost unknown when she made Winter's Bone, and her performance in the film made her a bankable star, and justly: she carries the film, she is its heart, and her scenes with John Hawkes, reliably good, and exceptionally good at being terrifying (see also Martha Marcy May Marlene), are highlights in a film full of highlights. 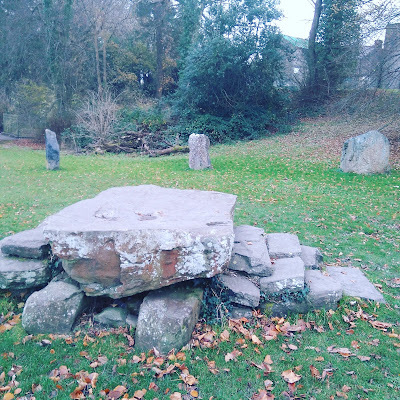 The setting is a character in its own right (helped by Dickon Hinchliffe's excellent, minimal sound design), the region shot to be as chilly as the reception Ree receives, and the location of the climactic scene, the film's one sequence of real horror, is as forbidding as any place I've ever seen in a film. And perhaps Ree survives because she is part of the landscape, lives in it, understands it. Her dreams are of squirrels and birds, of the hills and trees. 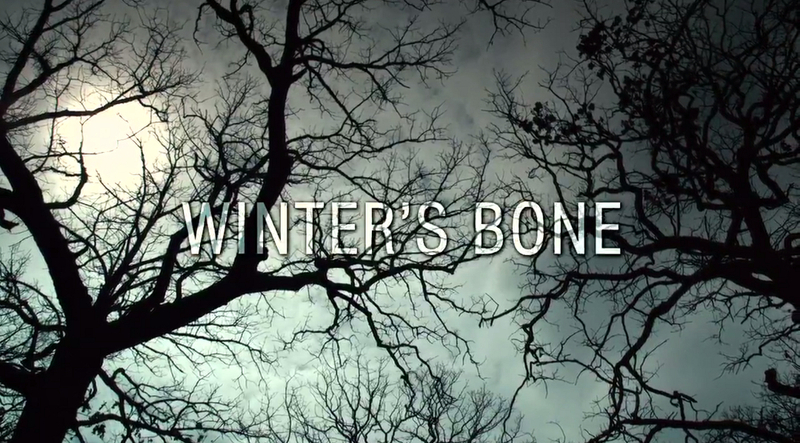 The horror of Winter's Bone lies in the horror of poverty. I read a terrible review of the film that dismissed it as just “another film about hicks” and I bridled at the snobbery of that, at the assumption that no one wants to know about poor people. But what Winter's Bone does right, in fact, is that it neither romanticises poverty nor pretends that these aren't real people, that understands that it's a brutal monster that leaches away compassion and human bonds. Ree stands against the erosion of human connection, of family; she does what is right selflessly and without complaint. Even at the end, when she has to participate in an act of surpassing gruesomeness, she does so because she does what she has to do. Poverty makes brutes of us, but, Ree shows us that it doesn't have to. Winter's Bone is a poetic, sometimes bleak, ultimately hopeful movie. But mostly, it has a truth to it.